We saw Iron Man 3 a couple weekends ago now, and I loved it! I wanted to watch it again as soon as it was over. I think Robert Downey, Jr. is just about perfect as Iron Man. As one reviewer put it, he can somehow make Tony Stark lovable, even as he’s being a total jerk. His comic timing is perfect as well.I loved the new abilities of the suit, too. And I liked the reversal in the story, where Tony had to spend some time all on his own, with nothing but his ingenuity and a newfound friend. Kinda like in the first Iron Man. What’s interesting to me is that even though I thoroughly enjoyed it, I’m finding I don’t have a lot to say about it. Which echoes what I read in another review — it was like taking a really cool, really long ride at Universal Studios. Fun, exciting, thrilling, visually captivating, but when you’re done… well, it’s over. So here I am, it’s April 14th, two weeks since my last post. I really had intended to get more regular in posting but somehow… it didn’t happen. I can hardly believe we’re already halfway through April. Reminds me of the young man the car repair shop got to bring me home last week and then bring my car back to the shop (I’d arrived too late to catch the shuttle home and was going to have to wait a really long time for it to come back again). That was on a Monday. As I drove, he asked me how my weekend had gone, what I’d done. I told him it had been Communion Sunday and we’d had a pot luck, as we always do the first Sunday of the month, which was a lot of fun. We did a Chinese theme this month which turned out quite successful. Anyway, he nodded and agreed that sounded nice. “Helps to make the time go by faster,” he said. I blurted something about already having the time go by so fast, the last thing I want to do is make it go any faster! But for him, that was not the case. 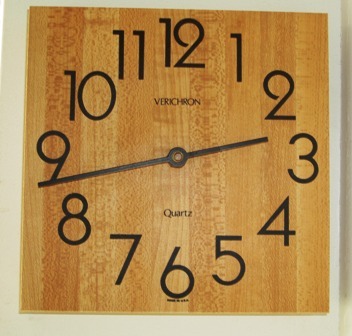 He apparently was chronically in search of things to make time pass. The last time I can recall really feeling that way was in elementary school when I was certain there was something wrong with the clock because for those last twenty-five minutes before school was out it seemed the hands stood still. Now it seems they twirl madly about the central axis as if I’m in some sort of time machine. If I didn’t have a glorious reunion with my Lord and Savior to look forward to in heaven — and the fact I’ll never again have to concern myself with time’s passage, fast or slow — I might be alarmed at the speed at which it’s passing. But I canNOT imagine being in a situation where I’m desperately searching for something to just “fill the hours.” I may not make the best use of my hours, but I have no dirth of things I’d like to do with them. In fact, my problem is having waaay too many things I’d like to do. Far more than I can possibly do in this lifetime. That used to bother me, but I’ve begun to see it as a sort of idol. Or if not that, then a desire that doesn’t necessarily spring from the mind of Christ. We live in an incredibly rich environment when it comes to things we can do and have. And we’re constantly being bombarded with advertising about them all. With new ones appearing every day. TV. Radio. The Internet. Even if you try not to look for things, those blankety-blank windows rise up before you whenever you click to a new page. They pop up, slide up, drift from the side, drop down from the top, pop up some more and even if “Internet Explorer has blocked XYZ pop-up” you still get the pop-up that tells you the other pop-up was blocked… Who thought that was a good idea? I think I’ve complained about this before. Which is weird because I like all the stuff I’m complaining about. I just don’t like that there’s more of it than I can possibly enjoy. Last week, back before the election I wrote a post about the need to find a place for my mind, a “space that is free and uncluttered during the day” and said that I had come round to the renewed conviction that I really do have a need for a writing routine… a schedule. The problem is, I never seem to be able to keep it, once I start it. So what good would it do to set up yet another schedule to follow, knowing I would fail yet again? And what about all those promises from God that He was going to do things? How do I factor that in? Is it me or is it Him? And how can I know the difference? So I went to Him with these questions and He’s been answering me, though perhaps not in the way I expected. My first realization was that I’m trying to do too much. In addition to walking the dog, daily Bible class, and the routine basic chores of housekeeping and personal hygiene, there have been all these other things that have come to my attention that I’ve been thinking I’d like to do. Things like read the Bible through in a year by doing daily chapters; like doing a sketch a day, spending 15 minutes a day decluttering, practicing the piano every day. This in addition to taking care of the small garden I’ve inherited from my mother. It’s not enough to simply care for the two potted roses… I have to fantasize about finishing the brick patio, and doing many other things to improve the look of the yard. Then there are the projects… the sewing things… if I could just schedule in half an hour a week. And there are the cards. And some paper-crafting scrapbook type projects I’ve been wanting to do with the Psalms. I’ll need to set aside some time to attend to those. And don’t forget reading. I have a stack of books I’ve slowly accumulated through my readings of the various blogs… all of them waiting for my attention. If I just devoted fifteen minutes a day to them, I could get through them. 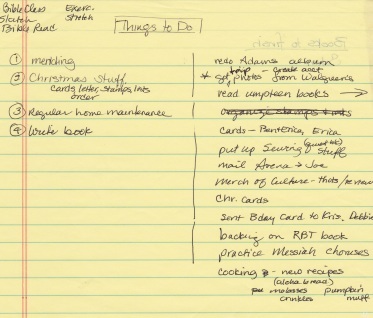 And of course all the things that need to be done relative to the holidays. Oh and baking! That’s fun. I love scones and coffee cake and cookies… I can always squeeze some of that in. Finally, there’s all the TV I’ve started watching — six shows now, six hours a week. At minimum. But this is time with my hubby… so I can’t eliminate that. I’m beginning to see some space-time continuum violations here as I’ve laid all this down (well, I saw them when I laid all this out last week, as well). Clearly I cannot do all that stuff. Even if I didn’t have to sleep, I wouldn’t be able to do all that. It’s… lunacy. Plus trying to break up your day (more like shatter it) into fifteen minute increments provides NO time for any kind of substantive thinking. And I think it’d just be frazzling, having to change gears every half hour. I think all this may be an artifact left over from my reading of The Artist’s Way a couple of years ago with its encouragement to think of all these things you’d like to do and then go do them. That is probably not exactly what was advised but that’s the way I took it, and it’s not been good for me. Furthermore, with all these “projects” or endeavors that I’m intending on constantly doing, I was leaving most of the materials needed to do them out around the house where I could see them and be “reminded.” Well, I was reminded all right and it wasn’t pretty: Oh yeah, I gotta do that wedding card; oh yeah, I want to scrapbook all those pictures; oh, right, I want to do a sketch today. And there’s those books I want to read. And the patio that I want to fix and the closet that needs to be cleaned, and the piano — I need to call the tuner, before it gets too out of tune again and if I’m going to do that, I’d better start playing it, too. and just muddling my way through each day trying to do the impossible. And when I inevitably fail, I heap on the guilt. So. I decided to make some changes. First, I acknowledged and accepted that I cannot do all the things I want to do to. Second, I put away all those half-done projects, so I’m not continually reminded that I want to do them. If there’s time, I might do a card. If not. Oh well. I have a book to write. I can do cards later. It turns out that “Out of sight, out of mind” really does work! That alone made a significant difference. I haven’t yet decided on what kind of schedule to follow with the writing itself. I’m afraid if I don’t get in and write immediately upon getting up, I won’t do it. But my hands don’t always work right when I immediately get up. (the CREST syndrome makes them go to sleep if I try to type for long; later in the day there’s no problem) So I’m still working on that. I think I’m going to go day to day and let the Lord lead me into the one that works best. Four, cut back on the TV! Tonight is my first cut: Hawaii 5-0. Much as I like Alex O’Loughlin in the role of McGarrett, I’m finding this season’s changes annoying. I don’t like McGarrett’s relationship with Catherine (which seemed to come out of the blue), I can’t stand his mother, and Danny’s been driving me increasingly up the wall. Plus staying up for a show that in Arizona ends at 10pm results in me not getting to bed until around 11 and that leads to either a later rising time, or me be awakened by Hubby when he leaves for work and then I get shorted on sleep. Getting shorted on sleep has a direct impact in my ability to withstand the impulses of my flesh to go do whatever tickles my fancy at any given moment. Finally, I’m going to follow Flylady’s method for establishing a new habit (work every day on the book) and according to her that takes a month of consistent practice. So I get a star for each day I go into the office and get some work on Sky done. Today was my first day of full implementation. I got into the office at 8am, and actually did get some work done on sky. Maybe about 3 to 4 hours worth (I forgot to note the times). I did not finish my weekly household chores, but I’m hoping to do so tomorrow. And once I publish this post I can do my stretching and then head straight to bed. And it’s not even 10 o’clock yet! 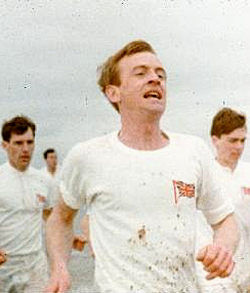 At the end of my last post I embedded the beginning sequence from the movie Chariots of Fire, a 1981 Academy Award Winner for Best Picture, Screenplay, Score and Costume Design. It was a period piece about two British athletes in the 1924 Paris Olympics, one of whom was Eric Liddell, a runner and a Scotsman born in China of missionary parents (and later a missionary to the Chinese, himself). A major part of the movie’s plot concerned Liddell’s refusal to enter the 100 meter race in the Olympics, an event in which he was likely to win gold seeing as he’d won the 1923 AAA championships in that distance in record-breaking time. In the film, he’s portrayed as learning upon arrival in Paris that the qualifying heats for the Olympics 100 meter race would be conducted on a Sunday, and he, being a devout Christian, refused to break the Sabbath in order to race. In 1980, when I first saw this movie, I remember thinking he was being legalistic, that Sabbath-keeping is not commanded for church age believers and that he was unnecessarily letting his teammates down. Yes, it was played for maximum conflict that way in the movie, with various teammates/coaches seeking to change his mind, and lamenting of the team losing out on a medal. He held firm, and did not compete in the 100, though he did run in the 400 meter race, a later race whose heats were not held on Sunday and which he was not expected to win. He won that one anyway, in spectacular fashion and record time. It worked for the story. But it wasn’t quite accurate. In reality, he’d learned of the 100 meter race’s Sunday qualifying meets months earlier and had decided long before he went that he would not be participating. So it wasn’t a big shock, and he wasn’t letting his teammates down at the last minute. Everyone knew what he intended from the start. Even so, it still caused a stir. Having read of his life, and seeing the importance he placed on the Gospel and on ministry, my thinking shifted on the Sabbath business, especially in light of what I saw and experienced in watching the most recent Olympics. I can see now that in the big picture for Liddell, even had he won a gold medal in that 1924 100 meter race it wouldn’t have meant that much. But his having abstained from running did. It interjected into all the hooplah and worldly mystique of The Olympics, not that he was some pious and “holy” guy, but that winning a gold medal didn’t matter to him nearly much as honoring God. And there is something very significant about that, in a setting where everyone gets to thinking that winning a medal is IT, the ultimate achievement, the top of the heap, the epitome of glory. When it’s really nothing. As my reader reminded me, sic transit gloria mundi: “the glory of the world passes away…” All flesh is as grass, here today, flowering, beautiful, then dried and gone tomorrow. And in the end, all the medals will be destroyed along with all the rest of this fallen world. What Liddell did later on in China was of far more significance than the 9.7 or less seconds of running a race and having a bunch of people cheer you. And in China, he did a lot. Who knows how many were brought to a saving knowledge of Christ through his efforts? When the Japanese invaded in 1943, and foreign nationals were advised to leave, he stayed. He went to help his brother who was running a medical mission and needed all the help he could get; in fact his brother was ailing from overwork and badly in need of furlough. So Eric took his place and sent him home. 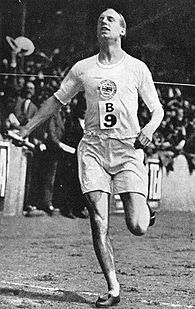 Eric Liddell died in that camp of what turned out to be an inoperable brain tumor. His last letter to his wife was written the day that he died. But here’s the coolest thing, something unknown even to his family until 2008. That was when the Chinese revealed that well before his death, he had been offered the chance to go home as part of a deal between the Japanese and the British. He turned the offer down, giving his place to a pregnant young woman instead. When you consider that act of sacrifice alone, winning a gold medal for running a 10-second race seems startlingly insignificant. I am LOVING this show! It is so fun, and it’s been very useful as well. But this last episode with the young bloodhounds, Duke and Daisy, was such a kick. Watching them act like Quigley used to was hilarious (okay, sometimes he still does act like that!). The clip below shows them running across the sofa, which Quigley did once long ago when he was so excited about my hubby coming home. In fact, that’s when they did it, too. Duke’s snatching the pillow was typical as well: The dog guy, Justin, arrives and is talking to the owner and suddenly here comes Duke with the sofa pillow, which means the woman has to break off talking to deal with him. And then he runs under the table with it… ! ROTFL!!! Yeah. Quigley does that with a sock. Or shoe, or anything he thinks we might value (a paper towel recently used! Hey, his discriminatory powers aren’t all that great). He trots in while we’re in the middle of watching TV and makes sure we notice, then when we tell him to bring it to us, the game is on. And they are SO gorgeous and cute. The hound pleading look… yeah, we get that one too, the way they kind of wrinkle up their eyebrows while they beg. Quigley, however, does NOT drink from the sink faucet, because I would never turn it on for him. He will drink from the dog water fountain on the walking path — the only one of our dogs to do that. Anyway, Justin had some suggestions for dealing with various behaviors that I think I’m going to use. The sit/stay for when my guests arrive is the first that I’m going to work on. I thought this was very cool. I read last week that the playoff game between the Patriots and the Broncos was expected to be watched by a record number of people. So when my football fan friends told me about the commercial that Focus on the Family aired during the game I had to go searching. And found it. It’s cool enough and good enough and clear enough… I’m sharing it. 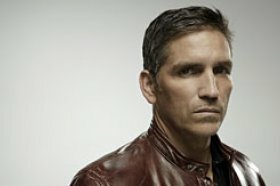 I’ve been watching Person of Interest, mostly because it has Jim Caviezel in it. I wasn’t sure from the trailers if I was going to like it, wasn’t even sure after the first episode or so, but the more I watch it, the better I like it. I loved Caviezel in Frequency and The Count of Monte Cristo, and was blown away by his portrayal in The Passion of the Christ. Of all the movie Jesus’s I’ve seen, his version is the closest to right on for me (except for the long hair, but that’s church tradition so I can live with it). Anyway, when I saw him in Person of Interest, standing amongst the crowds of people milling around him, I was struck by his height. I didn’t think, from the other movies that he was particularly tall, but standing on the sidewalk he seemed head and shoulders above the others. Well, Mel was almost right — it’s been quite awhile since Passion, and Caviezel’s not been seen in anything else out of Hollywood. I can understand it even apart from the bias and antagonism… the role was so powerful, so memorable, so Everywhere, that it could be hard to separate him from it when and if he were to play someone else. Person of Interest has been a good vehicle to start anew because the John Reese character is very different from Christ and yet… a savior in his own way.